Sometimes an aborted “Stella!!! !” can result in something stellar. 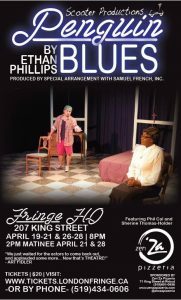 That’s the case with Penguin Blues , a production that lets its two-person cast shine in a moving presentation of addiction, denial, hope, and despair—all packed tightly into a 40-minute play. Phil Cal, who plays Gordon, and Sherine Thomas-Holder, in the role of Sister Angelita, previously worked on a production of A Streetcar Named Desire with Speagle and Rivet. (That production was never mounted.) However, Speagle felt that the quality of the actors and their natural chemistry deserved to see the light of day. And that’s where this production of Penguin Blues was born. Cal and Thomas-Holder play off each other extremely well and you can see there’s a genuine affection and trust for one another. Thomas-Holder, as a nun sent to a rehab facility for reasons she still questions—but are revealed later in the production—is the foundation upon which the play is built. She is the grounded half of this duo and allows Cal to shine without sacrificing the power of her own performance. Cal, for his part, excels as Gordon, a wise-cracking, street-smart alcoholic who is has been at the facility for almost two weeks and has been sent, as part of the overall therapy, to converse with Sister Angelita for 15 minutes. Those 15 minutes extend longer as the two peel away layer after layer of emotional barriers to get to the root of their challenges. And finally, the two come together in a dramatic final moment, where all pretence has been stripped away and they fall towards that metaphorical rock bottom. The set is sparse. A single bed, drably adorned, Jesus on the cross above the bed. One small table and a couple of chairs—and that’s it. And it’s perfectly appropriate for this show as it allows the focus to be where it belongs, on the dialogue and the performances of the actors. Both Cal and Thomas-Holder show a richness of emotion in this play, combined with a subtlety of expression. There are moments where both reach a crescendo of emotion and those moments are made all the more powerful because they’ve been built up to. The intensity is always there, but it simmers below the surface, slowly rising—and taking the audience along with it—until it finally boils over. After each presentation the cast and crew interact with the audience, part as a way to discuss the representation of alcoholism and how to improve the play – and an equal part catharsis, allowing viewers and performers alike the time to process what they’ve seen and talk about their experience. Often these post-play “debriefs” can feel forced and awkward, but in this case it works because the preceding 40 minutes has been so intimate. This is the second run for Penguin Blues , following a short three-day appearance in October at Procunier Hall. If possible, the Fringe HQ is even more intimate. It’s a production that combines quality and uniqueness in a way that shouldn’t be missed.